Govt of Bihar and Bill and Melinda Gates Foundation has signed a memorandum of Cooperation to set up Technical Support Unit. Patna, 19 September 2017: Govt. of Bihar (GoB) working over the years has been successful to bring in some commendable achievements, particularly in the areas of Health and Nutrition in the state. The initiatives of GoB brought about positive results in the reduction of IMR and MMR status in Bihar. Augmenting the sustained efforts of the State Government, to achieve key Health and Nutrition outcomes, a Memorandum of Cooperation was signed between Govt. of Bihar and the Bill and Melinda Gates Foundation, in 2010. In accordance with it, a Technical Support Unit (TSU) was established in the state in 2014. In the first phase of the TSU it worked closely with the Department of health and ICDS to effectively improve quality and coverage of Maternal and Child Health, family planning, and nutrition intervention. Through AMANAT (On-site mentoring) intervention around 3940 Nurses and 127 Doctors are being trained in 400 PHCs/CHCs/FRUs and 21 District Hospitals. In a sustained synergic effort to further improve the health and nutritional status in Bihar, strengthening of health systems and ensure quality in the Continuum of Care, Government of Bihar in collaboration with Bill and Melinda Gates Foundation (BMGF), CARE India, the Second Phase of Technical Support Program, has been launched. 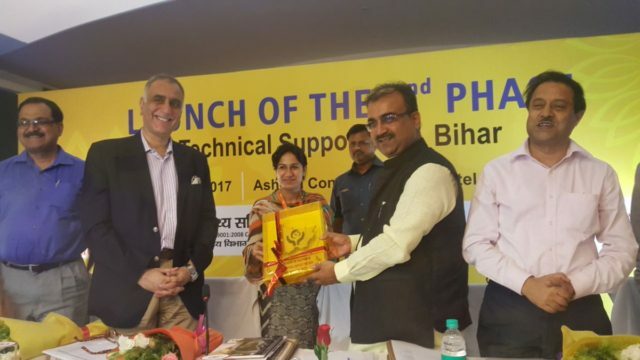 Health Minister Mangal Pandey, launched the program today at Patna, with the lightening of the lamp. Speaking on the occasion, the Minister mentioned that in a very short stint of time as a minister, he got a very convincing feedback about the good work which TSU is performing. Applauding the efforts of BMGF, CARE India, and other Development partners, he mentioned that despite some positive changes in Healthcare scenario in Bihar, there are a lot of areas that would further be looked into in this 2nd Phase of TSU program. He also stressed on the use of technology to bring efficiency in the health delivery system and also requested BMGF and Care India particularly to apprise the government about the new Innovations happening across the Globe. R.K. Mahajan, Principal Secretary, Health, lauded the GoB efforts particularly in building the necessary infrastructure and capacity development of the service providers. Emphasizing that there is a further scope of improvement, he stressed on State Government’s commitment to provide quality Healthcare to people, improve the health infrastructure across the state, and work continuously towards establishing a people-centric Healthcare system in the state. Chief of Party, Technical Support Unit, Dr. Hemant Shah highlighted the focus area which TSU would be focusing on the next phase like human resource-centric systemic improvement measures and strengthening supply procurement area. He reiterated TSU continued support to achieve GoB Mission Manav Vikash goals. The event has also been graced by the presence of State Program Officers, SHS, Bihar, Assistant Director ICDS, Training officer-ICDS, Rajan Bahadur, MD and CEO CARE India, Usha Kiran, Country Lead, State Health and Community Systems, BMGF, and representatives from CARE USA and other dignitaries from Health Department. This LAUNCH is being looked upon as the beginning of a new era in the Health Care Spectrum of Bihar.